“The search and rescue operations continue for the remaining five U.S. Marines who were aboard the KC-130 Hercules and F/A-18 Hornet involved in a mishap about 200 miles off of the coast of Japan around 2:00 a.m. Dec. 6,” the Marines said. Debris from the crash has also been discovered, Martinez said. Three Japanese ships are on scene, as are U.S. Marine Corps special operations MC-130s, several Japanese UH-60 equivalents and other Japanese search and rescue aircraft and a Rivet Joint. “We are in the middle of a massive rescue operation," Martinez said. At a news conference, officials from the Japanese Ministry of Defense said the three ships are the submarine rescue ship JS Chiyoda and two destroyers used as training ships, JS Setoyuki and JS Yamayuki. 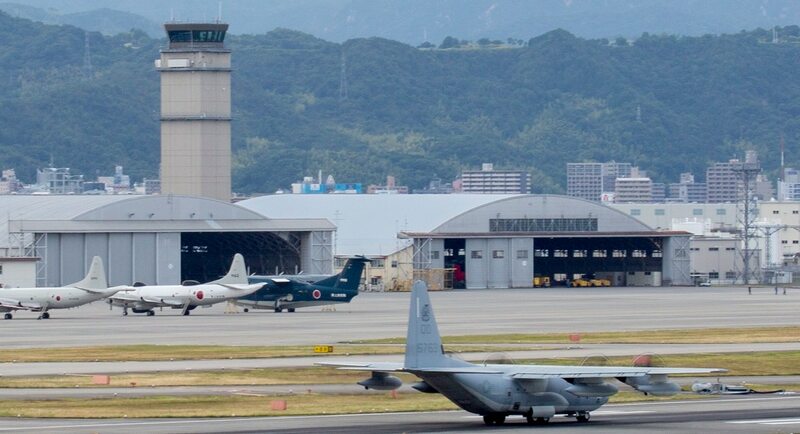 The MoD said a disaster dispatch request was made at 3:30 a.m. to the commander of Japan’s Central Air Defense Force from the commander, 5th Regional Coast Guard Headquarters. A UH-60 from the Hamamatsu Air Rescue Squadron took off for a search and rescue mission at 4:06 a.m. and other aircraft quickly followed. At 5:43 a.m., an SH-60 made the first recovery, one of the F/A-18 crew members, who reportedly is in stable condition. Japanese and U.S. forces were able to quickly dispatch to the crash site because the F/A-18 pilot’s wingman circled over the crash area until rescuers could arrive, Martinez said. Yokota Air Base has also put some of its C-130 crews on alert to assist throughout the evening. Col. Mark Mullarkey, commander of the 374th Operations Group, 374th Airlift Wing, at Yokota told Military Times that the first C-130 would depart tonight and run search patterns for the crew members. Mike Yeo of Defense News contributed to this report.